Obesity, an important risk factor for cardiovascular disease (CVD), is currently viewed as a pro-inflammatory state with an increase in the expression of inflammatory cytokines including Tumor Necrosis Factor-α (TNF-alpha) and Interleukin-6 (IL-6) along with the increased secretion of leptin. Serum leptin was estimated in 150 CVD patients (belonging to the age group of 35 - 75 years) of different Body Mass Index (BMI) and its correlation to various biochemical parameters including lipids, glucose and CRP was analyzed to study the association of leptin with CVD. Further to understand the relationship between obesity, inflammation and CVD, serum leptin, TNF-alpha, IL-6 was evaluated in 50 CVD and 50 non-CVD subjects. Results were presented as mean ±SD. A distinct correlation between leptin, TNF-alpha, IL-6 and BMI was observed and these cytokines were elevated in CVD subjects. The protein expression of the monomeric form of CRP which is known to be expressed in pathological condition was found to be highly expressed in serum of CVD subjects. Further, to substantiate the role of inflammation in obesity related CVD, different concentrations of leptin were added to Peripheral Blood Mononuclear Cells (PBMC) isolated from twenty healthy volunteers of different BMI and the gene expression of TNF-alpha, IL-6 and Ob-Rb were studied. A significant increase in the level of these cytokines was observed with increasing leptin concentration. The results obtained from the present analysis suggest that inflammation may be a crucial factor involved in obesity associated CVD. Leptin, (ob gene product) a 16 kDa adipocytic protein hormone is known to play an important role in the regulation of food intake and energy expenditure . It is also found to be involved in hematopoiesis, angiogenesis, reproduction and its receptors are widely distributed in immune cells, vascular smooth muscle cells, endothelial cells etc . The pleiotropic nature of leptin is supported by the universal distribution of OB-R leptin receptors. It interacts with six type of receptors (ob Ra - ob Rf). However, the long full length isoform, Ob-Rb, is the only isoform that contains active intracellular signaling domains. Leptin is reported to be an important determinant of inflammation . Our previous study showed that leptin may play an important role in polycystic ovary disease (PCOS) . Leptin can directly stimulate inflammatory response by activating pro-inflammatory cytokines such as Tumor Necrosis Factor-α (TNF-α), Interleukin-6 (IL-6)  and elevate acute phase proteins such as C-reactive protein (CRP) . TNF-α and IL-6 are multifunctional cytokines that act as major regulator of acute inflammation . TNF-α is associated with insulin resistance and IL-6 is known to stimulate secretion of CRP, a well known atherogenic marker that is reported to influence systemic inflammation [7,8]. In addition, leptin has also been reported to be independently associated with increased serum CRP levels . National Health and Nutrition Examination survey shows that CRP and BMI are positively related to each other and also to atherogenesis [10,11]. The human CRP molecule (MW 1, 15,135) is composed of five identical non-glycosylated polypeptide subunits (MW 23,027) each containing 206 aminoacid residues. During pathological condition, monomeric form of CRP (25 kDa) is known to be predominantly expressed. These inflammatory markers may be associated with the risk of recurrent myocardial infarction and death. Thus, Obesity can be regarded as a pro-inflammatory state but the mechanism linking increased fat mass with inflammation associated Cardiovascular Disease (CVD) is not known. In the present study, we have investigated the association of serum leptin with BMI, biochemical and most important inflammatory markers such as TNF-α, IL-6 and CRP in CVD patients and compared with non-CVD subjects. We also investigated the monomeric form of CRP in these subjects. The effect of leptin on the gene expression of pro-inflammatory cytokines such as TNF-α, IL-6 and Ob-Rb were studied in vitro in peripheral blood mononuclear cells (PBMC) by adding leptin of different concentrations to the cultures. To enumerate the influence of leptin over inflammation, a separate study was performed in which serum TNF-alpha and IL-6 were analyzed in 50 CVD and 50 non-CVD subjects. Serum parameters such as glucose was estimated by glucose oxidase-peroxidase method , cholesterol using cholesterol oxidase-peroxidase method , high density lipoprotein (HDL)-cholesterol using the glycerol- 3-phosphate oxidase-peroxidase-N-ethyl-methyanilin propan-sulphonate sodic method  and triglyceride using GPO-POD-ESPT method  using auto analyzer (BAYER RA 50; Bayer Company India, Guindy, Chennai, India). Serum Leptin (Diagnostic Biochem Canada Inc Kit, Canada), TNF-alpha and IL-6 (Orgenium Laboratories Business Unit, Finland) were measured using sandwich Elisa kit and hs-CRP (SPINREACT, Spain) using latex turbidometry method. Pearson correlation analysis was performed to examine the relationship between serum leptin levels and BMI, hs-CRP, TNF-alpha, IL-6 and other biochemical, endocrinal parameters. Student’s t-test was performed to analyze the differences in mean values between the groups. Leptin levels among the four BMI groups in both CVD and non-CVD subjects were analyzed using one way ANOVA. The results were presented as mean +SD. The analysis was two-tailed and performed using a software program (SPSS 17 for windows, student version). 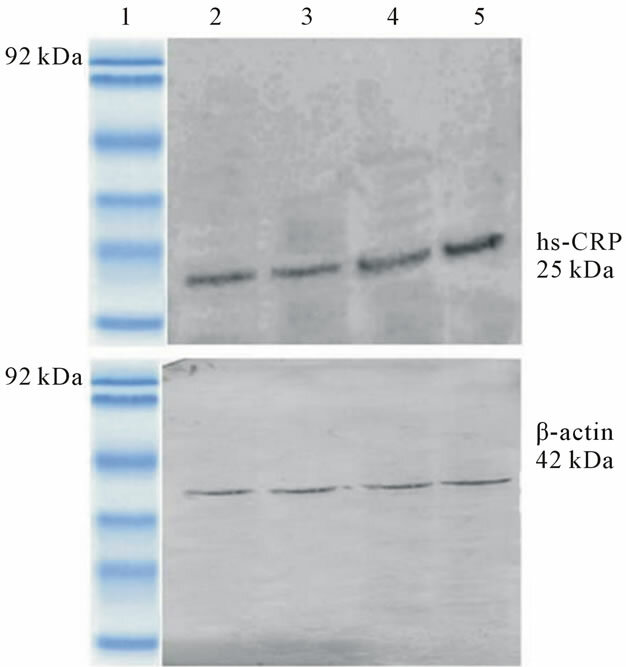 The protein expression of monomeric form of CRP from serum samples of CVD and non-CVD was assessed by western blot analysis . Serum samples were obtained from 30 CVD and non-CVD subjects under study and the protein was estimated by Lowry method. Equal amounts of protein (30 µg) were run out in 15% NATIVE-PAGE to analyze if CRP existed in monomeric form in CVD subjects. The proteins were then subsequently transferred to nitrocellulose membrane and blocked in Tris-buffered saline with Tween 20 containing 5% non-fat dry milk for 1 h at room temperature. Blots were then incubated overnight at 4˚C with sheep antihuman CRP (MP Biochemicals, India) and β-actin (Sigma) antibodies. The antigenantibody complexes were visualized using peroxidase conjugated antigoat IgG antibodies (1:2500). The immunoreactive bands were analyzed using DAB chromogen system (Bangalore Genei, India). The correlation between the ob gene product (leptin), biochemical and inflammatory markers were studied in CVD patients and the values were compared with those of the non-CVD subjects. Table 1 shows the values of leptin, the biochemical parameters and CRP of the subjects under study. In this study, the amount of leptin estimated in non-CVD subjects were found to be 2.59 ± 0.645, 9.42 ± 8.6, 16.85 ± 17.0 and 22.51 ± 20.94 in thin, normal, overweight and obese groups respectively. In the case of CVD subjects, the leptin levels were 7.35 ± 5.74, 11.86 ± 7.5, 18.79 ± 13.66 and 24.54 ± 15.90 in corresponding groups. (Table 1(c)). A notable finding is that serum leptin shows a positive correlation with BMI (r = 0.4, p = 0.001). In the case of non-CVD subjects, there is an increase in the leptin values as function of BMI. The values of leptin were interestingly found to be higher in CVD when compared to that of non-CVD subjects in all categories. However, the difference in leptin values obtained for CVD and non-CVD is much pronounced in thin and normal BMI when compared to that obese subjects. This is a clear indication of the correlation between leptin values and increased BMI irrespective of the disease condition. Serum fasting glucose was found to be within the normal limits in the case of control subjects but there is significant increase in these values in the CVD subjects (Table 1(c)). The diastolic and systolic values were well within the normal limits in thin, overweight, obese nonCVD but certainly increase in CVD in each category. 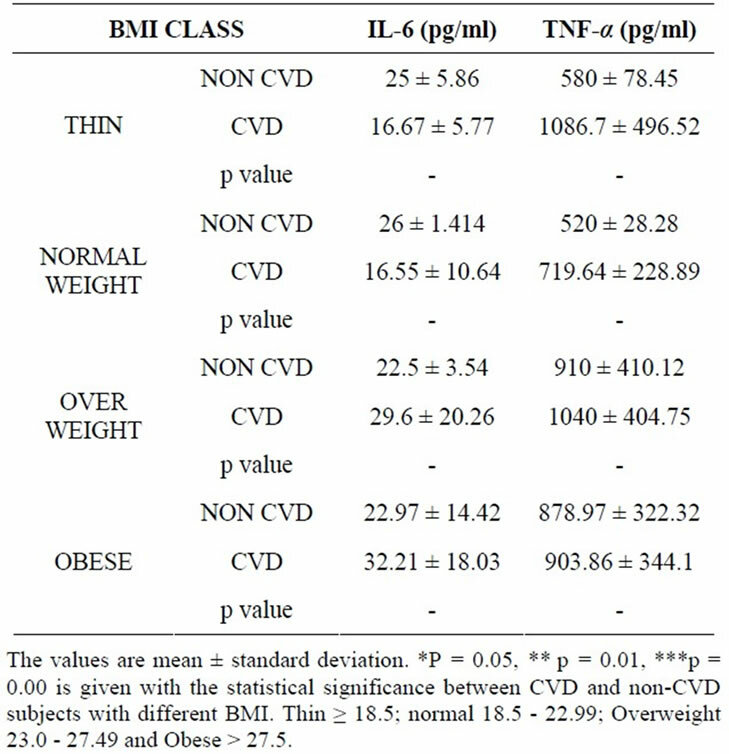 The variation in the diastolic and systolic values obtained in CVD and non-CVD subjects is clinically significant and observed as an increase in relation to BMI (Table 1(b)). In addition, waist to hip ratio was also found to increase with BMI as it is indicated in normal, overweight obese subjects and the values are again significant in overweight and obese subjects. Analysis of the biochemical parameters has yielded some interesting results (Table 1(a)). The values of triglycerides remain within the normal limit in the control subjects but showed a considerable increase in CVD subjects. The values obtained increases steadily with BMI suggesting that triglycerides could be a greater risk factor in obese condition. CRP, a signaling product of TNF-α and IL-6 has been implicated as an important risk factor for atherosclerosis and CVD events. In the present study, hs-CRP values were found to be 1.072 ± 0.86 mg/L, 1.73 ± 1.75 mg/L, 2.58 ± 2.32 mg/L and 3.03 ± 3.40 mg/L in thin, normal weight, overweight and obese groups of non-CVD subjects. In contrast, hs-CRP values of CVD subjects were 5.13 ± 3.47 mg/L, 5.52 ± 3.0 mg/L, 5.17 ± 2.91 mg/L and 7.49 ± 3.04 mg/L (Table 1(c)). Our results show that CRP values are within the normal limit of <3 mg/L in non-CVD subjects but increased in CVD subjects. In a separate study, serum leptin, TNF-alpha and IL-6 were estimated in 50 CVD and 50 non-CVD subjects (Table 2). A positive correlation was observed between leptin and IL-6 (r = 0.3, p = 0.001) in the case of CVD subjects. Table 1. (a) Values of BMI and biochemical parameters in CVD and non-CVD subjects; (b) Values of BMI, waist to hip ratio, systolic and diastolic blood pressure in CVD and non-CVD subjects; (c) Values of BMI, glucose, hs-CRP and leptin in CVD and non-CVD subjects. Table 2. Values of IL-6 and TNF-alpha in CVD and nonCVD subjects. lanes (2 - 5) correspond to the samples from thin, normal, overweight and obese subjects respectively. CRP expression is pronounced in the case of overweight and obese subjects and most striking observation is that monomeric form of CRP is not expressed in thin and normal subjects. 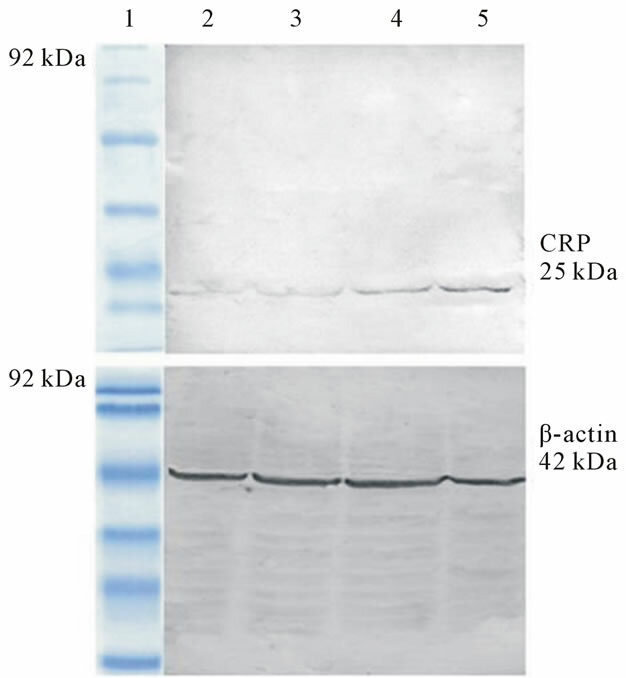 Figure 1(b) illustrates the protein expression levels of CRP from serum of CVD patients using western blot. The expression of serum CRP is enhanced in CVD cases and is found to increase with BMI suggesting that CRP could be expressed distinctly in obesity associated CVD. Thus CRP can be regarded as a good inflammatory marker for CVD. In order to understand the association of obesity with inflammation, we evaluated the mRNA expression of the cytokines, TNF-α and IL-6 in the presence of human recombinant leptin of varying concentrations in human PBMCs. Figure 1. 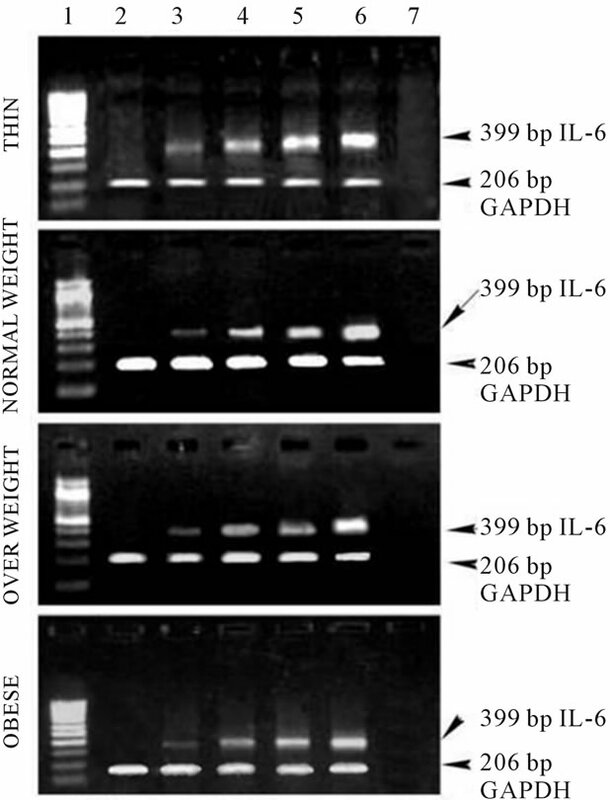 (a) Immunoblot analysis of monomeric form of CRP from the serum of non-CVD subjects, Lane 1: Low molecular weight protein marker; Lane 2: Serum from thin non-CVD subjects; Lane 3: Serum from normal non-CVD subjects; Lane 4: Serum from overweight non-CVD subjects; Lane 5: Serum from obese non-CVD subjects; (b) Immunoblot analysis of monomeric form of CRP from the serum of CVD subjects, Lane 1: Low molecular weight protein marker; Lane 2: Serum from thin CVD subjects; Lane 3: Serum from normal CVD subjects; Lane 4: Serum from overweight CVD subjects; Lane 5: Serum from obese CVD subjects. obese subjects. Also, there is an enhancement in the TNF-α expression in obese for any given concentration of leptin when compared to thin and normal weight subjects. Figure 2. (a) Expression of TNF-α in human PBMCs, Lane 1: 100 bp Marker; Lane 2: PBMC cells without leptin; Lane 3: PBMC cells with leptin (250 ng/ml); Lane 4: PBMC cells with leptin (500 ng/ml); Lane 5: PBMC cells with leptin (750 ng/ml); Lane 6: PBMC cells with leptin (1000 ng/ml); Lane 7: PCR negative control; (b) Expression of IL-6 in human PBMCs, Lane 1: 100 bp Marker; Lane 2: PBMC cells without leptin; Lane 3: PBMC cells with leptin (250 ng/ml); Lane 4: PBMC cells with leptin (500 ng/ml); Lane 5: PBMC cells with leptin (750 ng/ml); Lane 6: PBMC cells with leptin (1000 ng/ml); Lane 7: PCR negative control; (c) Expression of Ob-Rb in human PBMCs, Lane 1: 100 bp Marker; Lane 2: PBMC cells without leptin; Lane 3: PBMC cells with leptin (250 ng/ml); Lane 4: PBMC cells with leptin (500 ng/ml); Lane 5: PBMC cells with leptin (750 ng/ml); Lane 6: PBMC cells with leptin (1000 ng/ml); Lane 7: PCR negative control. that in obese individuals with increased levels of serum leptin, TNF-α and IL-6, inflammation could be a factor linking obesity and CVD. 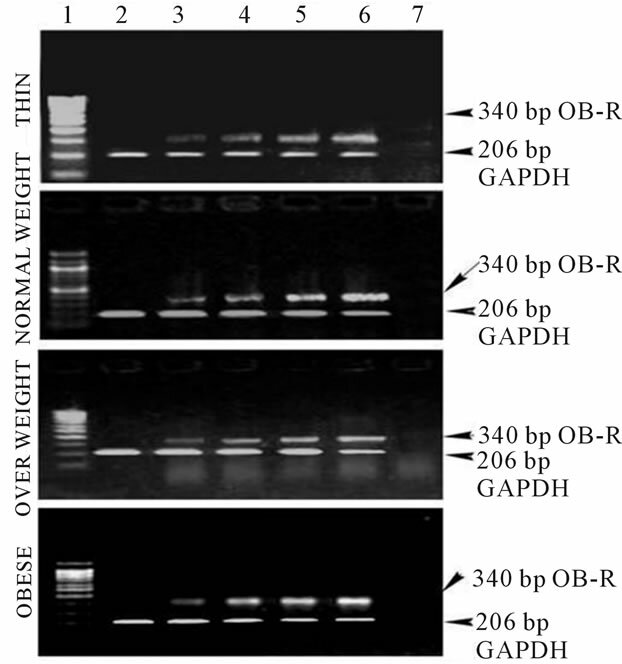 Figure IIC shows gene expression of the Ob-Rb in human PBMCs of varying BMI. Like, TNF-α and IL-6, gene expression of Ob-Rb also increased with increasing leptin concentration. CVD is currently emerging as a metabolically complicated disorder with inflammation impeding an active participation in the disease pathogenesis . Leptin has been found to circulate at higher levels in obesity and independently associated with insulin resistance and cardiovascular disease (CVD) in humans . Hence, with a view to understand the role of leptin in augmenting inflammation in CVD, we measured the serum levels of leptin, TNF-alpha, IL-6 and CRP in CVD patients. Intriguingly, our results also reveal a significant correlation between serum leptin and measures of obesity including BMI, waist-to hip ratio values. Leptin is found to exhibit an adiposity dependent pattern of increase in CVD and non-CVD subjects under study. Also, leptin value is found to be higher in CVD subjects when compared to that of non-CVD subjects. Triglycerides are considered as an important cause of leptin resistance by mediating impaired transport across the Blood Brain Barrier . In the present study, a prominent increase in serum triglyceride level with BMI in turn suggests that triglycerides could pose a greater risk in obese condition. TNF-α and IL-6 are the cytokines that are known to be expressed during inflammatory condition and recent reports have suggested that these are elevated in obesity related inflammatory diseases. Our study for the time shows the elevation of these inflammatory cytokines serum of CVD as well as obese subjects under study. High levels of serum TNF-α observed in CVD subjects also suggest that this could be an important factor associated with leptin and insulin resistance in them. IL-6, an important adipocyte derived inflammatory marker is secreted from a variety of tissues including activated leukocytes, endothelial cells and adipocytes [18,19]. It is suggested that obese human and animals possess significantly higher levels of circulating IL-6 [20-23]. A similar pattern is observed in the present study wherein IL-6 is markedly elevated in obese subjects and also in CVD subjects. CRP, a signaling product of TNF-α and IL-6 has also been implicated as an important risk factor for atherosclerosis and CVD events. CRP is known to exist in a pentameric structure with each polypeptide chain of molecular weight 25 kDa. In pathogenic condition, CRP is known to be degraded to a monomeric form especially in inflammatory diseases. Thus CRP can be regarded as a good inflammatory marker for CVD. Our study shows a higher level of serum CRP in CVD subjects. Moreover, immunoblot analysis of the 25 kDa monomeric form of CRP also indicate that the protein expression of CRP is expressed in higher levels in CVD subjects and in baseline levels in non-CVD subjects. Leptin seems to be one of the major players in the immunoendocrine scenario and the active participation of leptin in immunity and the proportional increase of blood leptin levels with adiposity contribute at least in part to the chronic inﬂammation in obesity . In CVD subjects, serum leptin is found to exhibit a positive correlation to IL-6 (r = 0.3, p = 0.05) and this elevated inﬂammatory conditions might have profound inﬂuence on energy balance, metabolism and cardiovascular functions. 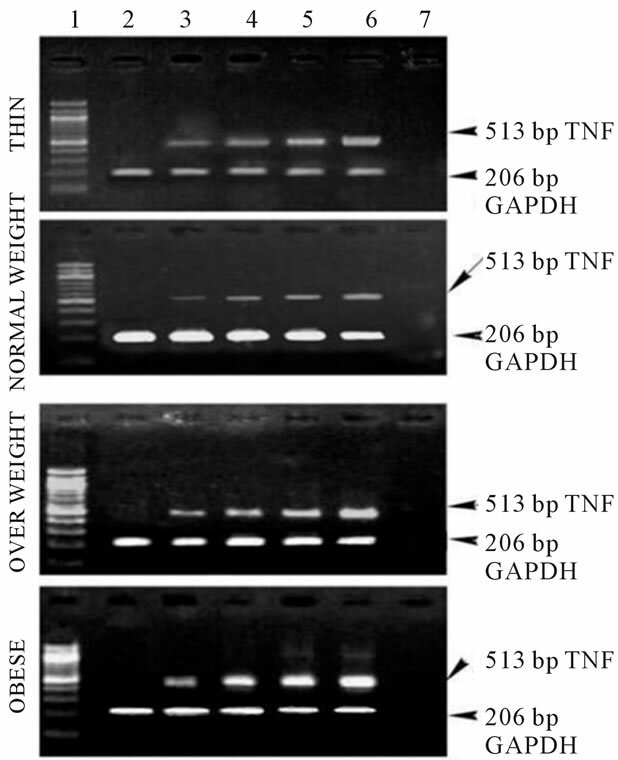 In order to understand the association of obesity with inflammation, we evaluated the mRNA expression of the cytokines, TNF-α and IL-6 in the presence of human recombinant leptin of varying concentrations in human PBMCs. The in vitro study also shows that the mRNA level of TNF- α, IL-6, Ob-Rb increases with increase in leptin concentration. Also, these cytokines have been found to be significantly overexpressed in obese subjects. This is in relevance to the fact that proportional increase of blood leptin with adiposity plays important roles in the regulation of immunity . The elevated expression of Ob-Rb with increase in leptin concentration in turn indicates that leptin receptor can get activated with increased leptin concentration. Furthermore, enhanced expression of these cytokines in obese subjects indicate that obese individuals with increased levels of circulating leptin are prone to inflammation and this may be a factor involved in obesity related cardiovascular diseases. The physiological significance of leptin induced proinflammatory cytokines production requires further investigation. Our studies suggest that the local induction of these cytokines by leptin may in turn provide a pathway for the pro-atherogenic role of leptin. The local activation of TNF-α could play a role in atherogenesis or insulin resistance. Thus, it can be proposed that leptin can activate PBMCs and hence could promote the incidence of inflammation associated CVD. The evaluation of leptin, biochemical parameters and inflammatory cytokines in CVD and control subjects have clearly demonstrated that leptin is highly correlated to BMI and inflammatory cytokines and hyperleptinemia can be detrimental as observed in CVD. From our clinical analysis and gene expression study, we suggest that leptin might stimulate inflammation by triggering TNF-α and IL-6 secretion which in turn might signal for CRP synthesis thereby promoting the incidence of CVD. • Financial support from University Grants Commission (UGC)—RGNF program (New Delhi), UGC— SAP program (New Delhi) and UGC Major Project (New Delhi) are to be gratefully acknowledged. • Ms. Devarajan Nalini, Research Scholar, carried out the in vitro work. • Dr. R. Malathi, Research Co-ordinator, interpreted the data and prepared the manuscript. C. Popa, M. G. Netea, T. Radstake, P. L. Van Riel, P. Barrera and J. W. M. Van Der Meer, “Markers of Inflammation Are Negatively Correlated with Serum Leptin in Rheumatoid Arthritis,” Annals of Rheumatic Diseases, Vol. 64, No. 8, 2005, pp. 1195-1198. G. Matarese, S. Moschos and C. S. Mantzoros, “Leptin in Immunology,” Journal of Immunology, Vol. 174, No. 6, 2005, pp. 3137-3142. S. Loffreda, S. Q. Yang, H. Z. Lin, C. L. Karp, M. L. Brengman, D. J. Wang, A. S. Klein, G. B. Bulkley, C. Bao, P. W. Noble, M. D. Lane and A. M. Diehl, “Leptin Regulates Proinflammatory Immune Responses,” The Journal of the Federation of American Society for Experimental Biology, Vol. 12, No. 1, 1998, pp. 57-65. M. B. Pepys and G. M. Hirschfield, “C-Reactive Protein and Its Role in the Pathogenesis of Myocardial Infarction,” Italian Heart Journal, Vol. 2, No. 11, 2001, pp. 804- 806. J. L. Beamount, L. A. Crison, G. R. Coope, Z. Feifar, D. S. Frederickson and T. Strasser, “Classification of Hyperlipidemias and Hyperlipoproteinemias,” Standard Methods of Clinical Chemistry, Academic Press, New York, 1972, p. 9. D. N. Holvey, “The Merck Manual of Diagnosis and Therapy,” Merck Inc., Rahway, 1972. T. G. Cole, S. G. Klotzsch and J. Mc Namara, “Measurement of Triglyceride Concentration. Handbook of Lipoprotein Testing,” AACC Press, Washington DC, 1997. J. M. Harkins, N. Moustaid-Moussa, Y.-J. Chung, K. M. Penner, J. J. Pestka, C. M. North and K. J. Claycomb, “Expression of Interleukin-6 Is Greater in Preadipocytes than in Adipocytes of 3T3-L1 Cells and C57BL/6J and ob/ob Mice,” Journal of Nutrirtion, Vol. 134, No. 10, 2004, pp. 2673-2677. Body Mass Index (BMI)Cardiovascular Diseases (CVD)C-Reactive Protein (CRP)Interleukin-6 (IL-6)Tumor Necrosis Factor-α (TNF-α)Peripheral Blood Mononuclear Cells (PBMC). *Conflict of interest: the authors declare no commercial or financial conflict of interest.